Heading north on I-26 on a Friday evening, I was looking for a barbecue dinner to start the weekend with. Everything I saw seemed run of the mill, until I saw the good reviews for Smok'y Blues (Why the apostrophe? I don't know, but I'll oblige them...). One blurb I read said they only cook with wood, so I bee-lined it in their direction, arriving barely 30 minutes before their 7:00 closing time. The restaurant is in a small shopping strip kind of off the main road, but it wasn't hard to find. As I pulled up, the staff were relaxing outside chatting with a customer. Inside, the restaurant was empty except for one table. A gentleman came inside and cheerfully explained the menu to me and took my order. He was pleasant through the whole meal despite me being the last customer of the day, but I did make a point to be on my way by their closing time. Not having had a real meal since breakfast, I opted for a two-meat combo of pulled pork- the staple of barbecue, and hash- an item I had never actually ordered before, but fairly common in South Carolina barbecue although the hash here is actually beef instead of pork. Within minutes, a heavy plate with a mountain of meat accompanied by a dinner roll and my side choices of their bourbon beans and potato salad was placed in front of me. I filled my cup from the tea dispenser and dug in- after a few photos. I found the pulled pork to be quite good. It did indeed seem to be cooked over wood, although the smoke flavor was just hinted at rather than made obvious. 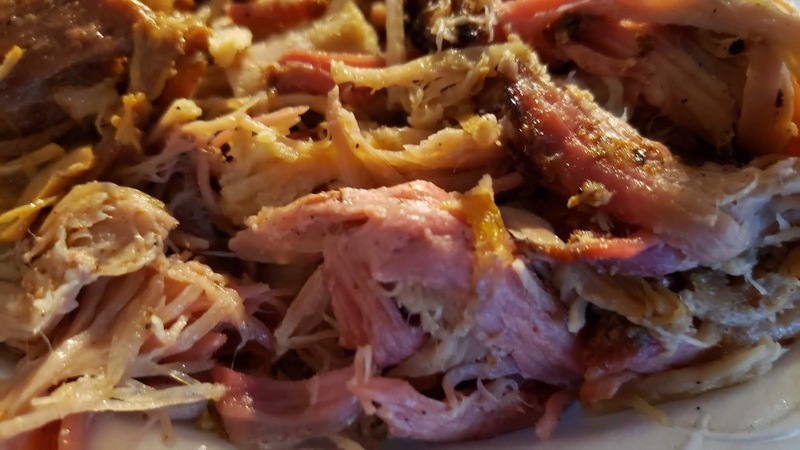 It was moist and flavorful, with the meat, the smoke and the seasoning combining equally rather than any one overpowering the other. The beef hash, which is more of a stew and served over rice, was good and filling. It's not technically barbecue as I view it, but it's been traditional in the area for a long time and I can see why. Like the pulled pork, it was seasoned simply which let the flavors of the meat come through. I was impressed by the sides. They seemed to be home made. 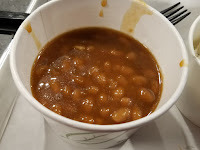 The beans were better than most, kind of sweet but balanced out well. 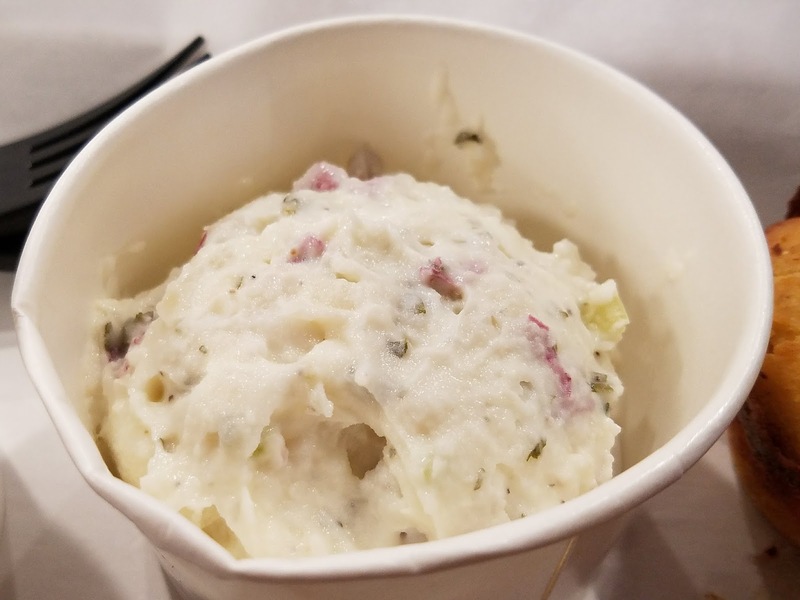 The potato salad was made with unpeeled white potatoes, which is a little different, but the heavy dressing made it work really well for me. They offered the typical mild, hot and mustard sauces. I rate them as average, giving the mustard a slight edge as the best for the pork, but then I usually lean towards mustard sauce anyway. 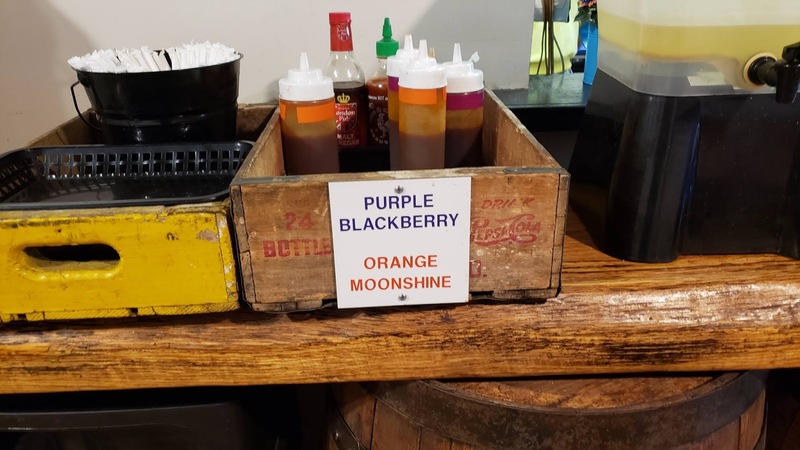 In addition, they had two specialty sauces; blackberry and moonshine. I've honestly never seen either of these before, but I was curious to try them. I thought the blackberry would be overly sweet like syrup, but it was actually quite good. It had just a hint of berry taste and wasn't any sweeter than a normal sweet sauce. I was not a fan of the moonshine sauce. It was sweeter than I expected and just didn't seem to add anything to the meat. Friendly service and a giant plate of good food made this a memorable stop for me, one I would come back to again if the opportunity arises. It's worth the short detour off the interstate. 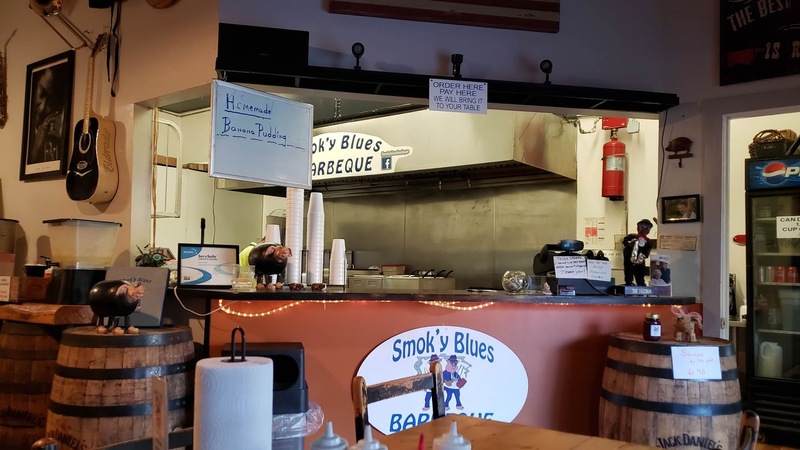 There are several other barbecue places in town, and I had my sights set on visiting one of them during our Christmas vacation in the area. 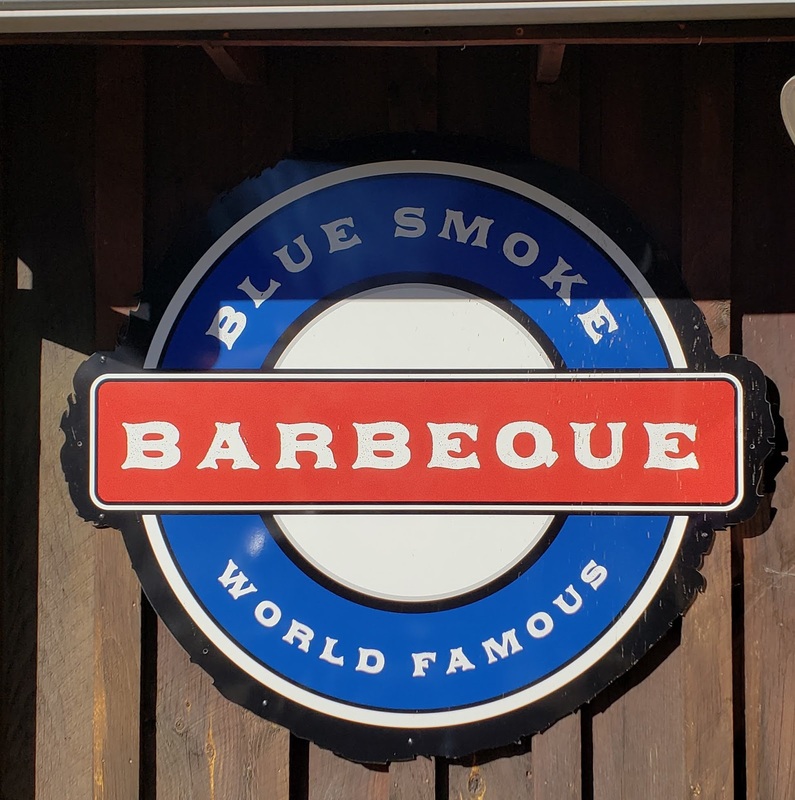 It ended up that we came to Blue Smoke instead when it was recommended by the hostess at another restaurant as a good option without having to wait over an hour in line. So we made our way up the hill to check it out. The cabin-like interior was too packed to accommodate our large group, but they did offer us the screened in back porch with picnic tables. It was a little too cold to enjoy, but would have been nice on a warmer day. 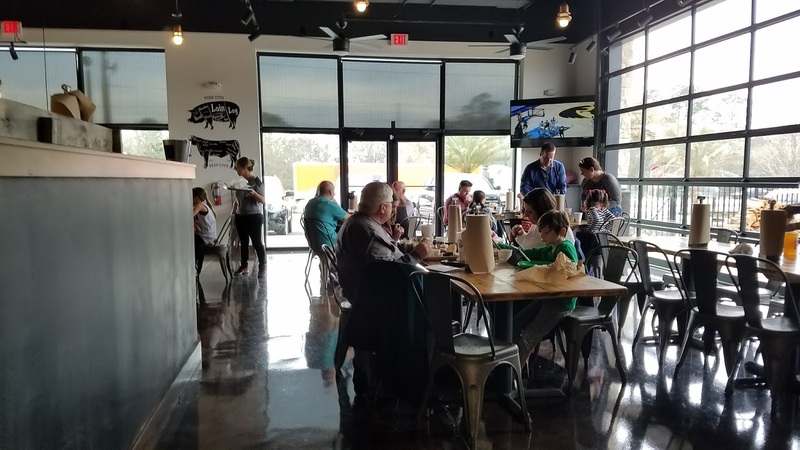 Fortunately, by the time we placed our orders at the counter, several small tables in the sun in front of the restaurant had opened up and we moved there. One advantage of eating with a big group is that it's easier to try more items. 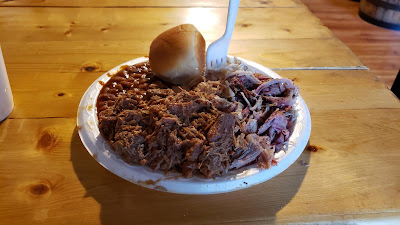 I shared a pulled pork and ribs plate with my wife, and also sampled some of my son's brisket. 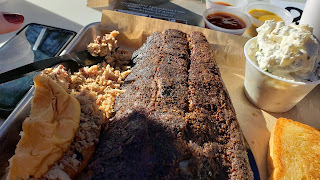 The cashier informed us that it was a Christmas miracle, as he got the last order of brisket before they ran out. I wish I could agree, but it was more like they pulled out the last scraps they could find which had dried out long ago. The brisket was a fail and my least favorite meat. The pulled pork was slightly better, though it was actually chopped and a little dry as well. It had some flavorful bits, and a little sauce brought it back to life enough to make a decent sandwich. By far the best part of my meal was the ribs. We got a good sized slab with meaty bones, just tender enough to pull easily from the bone and well seasoned. A little bit of actual wood smoke could have improved them, but they weren't bad at all for a tourist joint. The fries, both regular and sweet potato were good, and they give you plenty to fill up on if the meat doesn't do it for you. I also enjoyed the creamy potato salad. I will try one of the places a bit further off the tourist track next time before returning here. 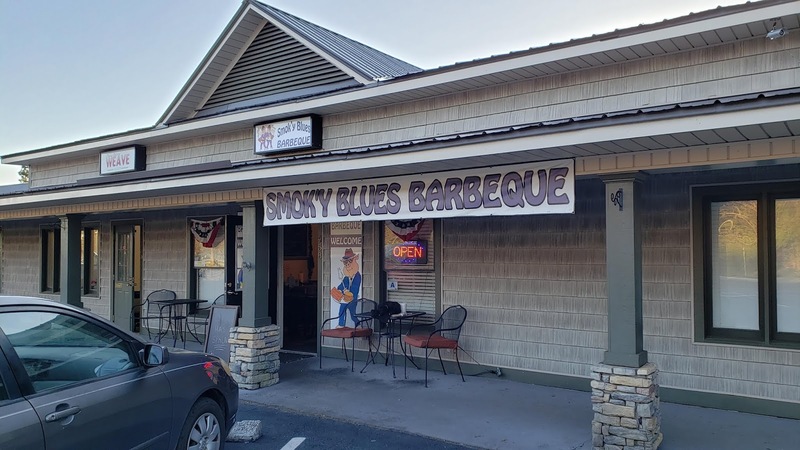 It is a good place to enjoy a decent meal, but not where I would recommend for the best real barbecue experience. After a couple more visits, I'm glad to be able to update and upgrade my review. 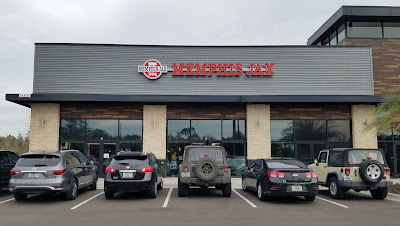 I still haven't tried everything on the extensive menu, but the pork, brisket and ribs have all made a good impression on me. 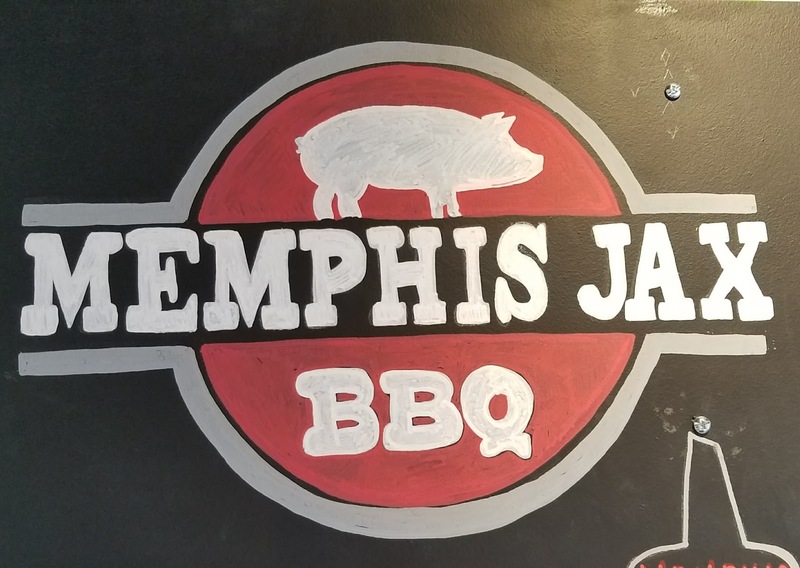 I wouldn't say any of them are exceptional, and on the last visit the flavor of the pork was down slightly, but I would rate all three above any average chain restaurant. 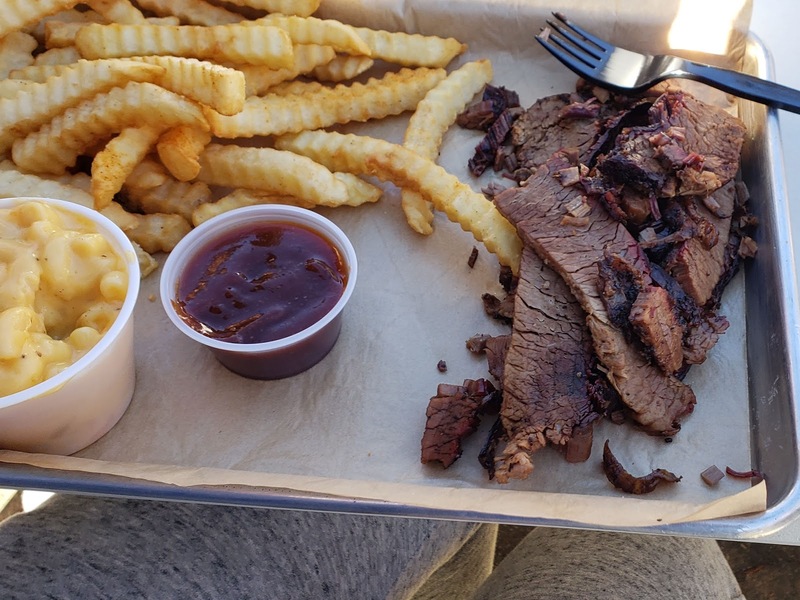 Sides are more than just an afterthought. 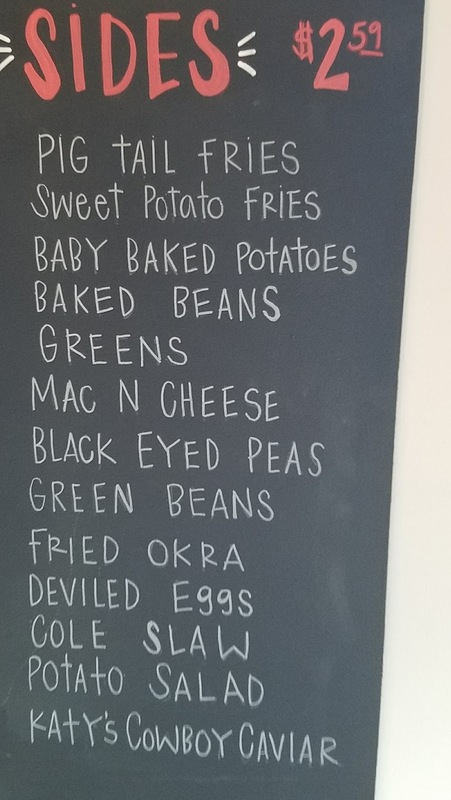 We enjoyed delicious collard greens, hot fries and more of their creamy style potato salad. I'm not the biggest fan of their sauces but that might just be me. Service has improved greatly. My latest meal was with a group of eight for Father's Day lunch. We arrived a bit after the lunch rush, but the restaurant was still over half full. All of our food arrived within five minutes of ordering and taking our seats. They were fully staffed with friendly, efficient employees who made our meal a pleasant experience. 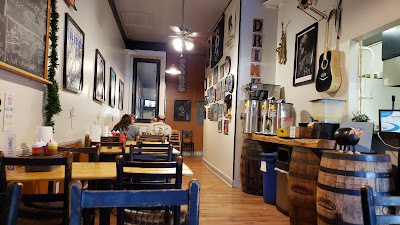 I usually like to give new places at least a few weeks to get up and running before I visit, but since this one is 5 minutes from the house, I figured I would brave the crowds and the opening weekend excitement. This is sort of a preliminary review- I'm sure I will update it as I make future visits and try more of the menu. Orders are placed at the counter, where if you are dining in they give you a number to place on your table. As all the tables were full, I took a seat at the small bar where I got a good view of the bustling serving line. They were slammed for the second day in a row, and close to running out of meat again as they did the day before. 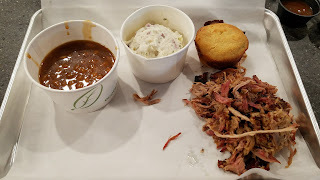 For this visit I stuck with my basic bbq lunch- pulled pork, baked beans and potato salad. 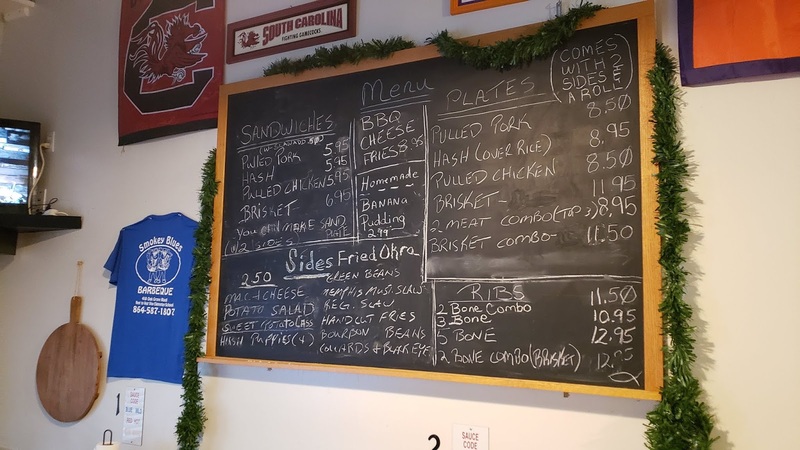 Their platters come with either a dinner roll or jalapeño cornbread, (I chose cornbread, because jalapeño) and topped it off with a sweet tea. The pork was right on- hot, smoky and barky. Although it was a decent sized portion, it looked small on the metal tray they serve their food on and almost made you wonder if it was actually a $15 lunch, which is what it came to with a drink. The pork redeemed itself though, and I especially liked their full-flavored original sauce with it. 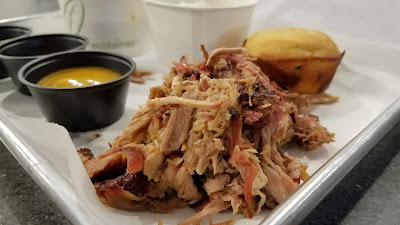 The hot sauce was pretty good too, but I felt like the mustard sauce, which is usually my favorite with pork, was an afterthought that needed more flavor than just mustard. My sides were just average. No complaints on the potato salad, but it didn't stand out either. The beans seemed straight out of a can with maybe a couple specks of meat sprinkled in. The tea was average as well. Service was friendly, if slow, which is understandable with how busy they were. I waited over 30 minutes for my food, but it was fine on a Saturday afternoon and didn't bother me. To be constructively critical, my opinion is they are trying to offer too many choices. 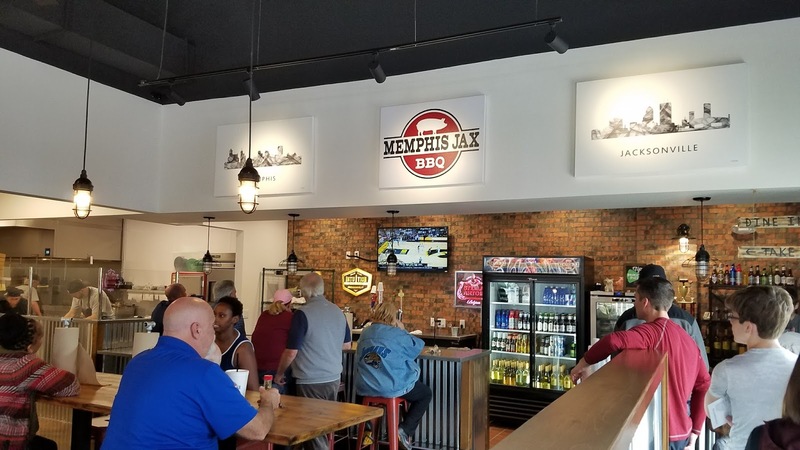 Besides all the typical meats and more, they also offer pizza, catfish and other non-barbecue items, as well as a long list of sides. This leads to extended prep time in getting food out. It might have been better to start with a smaller menu and add items as they have the chance. I would hate to see their good barbecue get lost in the clutter of everything else, which happens a lot. Time will tell- I can only hope a barbecue joint this close to home will stay in business and stay consistent. I will be back to try more items and update my review- hopefully upward.